Birdhouses are not just for nesting season. Hanging birdhouses now or cleaning out those already on your property can help birds survive the winter. 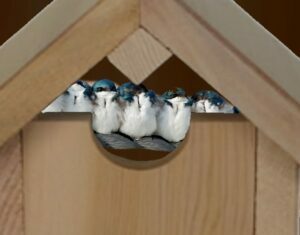 During blustery winter weather, songbirds can be found huddling together in groups inside birdhouses. It shelters them from the wind and ice, and their shared body heat turns the nesting area into a warm room. Plug up the ventilation holes with dried grasses to prevent drafts. In March, clean the birdhouses and unplug the holes for the spring nesting season. Another way to supply shelter is with your Christmas tree. Instead of throwing it out after the holidays, place it in a quiet corner of your yard until spring. This will provide natural shelter for birds and protect them from the wind. Before placing the tree outside, remember to remove all tinsel and garland that could be unsafe for the birds. Along with providing shelter, supplying fresh shallow water can make life easier for your backyard birds. During frigid weather, natural open areas of water may not be safe. Unfrozen water of lakes and rivers may be too deep for songbirds to enjoy, and are often found out in the open where predators can see them. Placing a heated birdbath in your yard will attract a larger variety of songbirds that don’t regularly visit feeders. An inexpensive alternative to a commercial heated birdbath is a heated water bowl for dogs. Placing the bowl on the ground under bushes or on top of a regular cement birdbath will work just fine. Put a clay flowerpot saucer in the center of the water as a platform for the birds to stand on and you can be certain you will have many feathers visitors enjoying the safety of your yard. Water and shelter are precious commodities in the freezing weather. Providing a safe haven will not only help the birds but will also attract many more species of wintering birds for your viewing pleasure.